Made in Chelsea star Millie Mackintosh has joined forces with Nouveau Lashes to produce a range of eight pairs of strip lashes named after some of her favourite London haunts. As a professional make-up artist herself Millie has high standards when it comes to her beauty products and has made sure that her own line cuts the mustard by being involved in every stage of the design process. 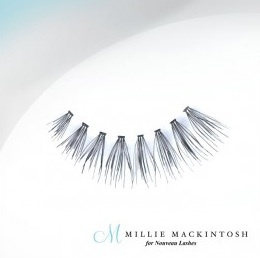 All eight sets of lashes are made from natural hair in a bid to give a more natural look, allowing women who are a fan of Millie’s very sophisticated and low-key style to emulate her make-up look. Belgravia – A lash that Millie describes as her ‘everyday lash’. These lashes are brown in colour so look extremely natural and understated when applied. Camden – These lashes are designed to suit an ‘alternative’ kind of girl and result in a dramatic and catchy look. Carnaby – These 60s inspired flirty lashes will help you put a swing into your look. City – Brown in colour but a mixture of short and longer lashes make for a professional look with a sharp and smart edge for girls who means business. Mayfair – A lash that flicks out at the outer corners to transform any eye shape to cat like and instantly stylish. Portobello – Long and wispy black lashes for a doll eyed vintage Notting Hill girl. Shoreditch – Flicking out at the outer corners and packed full of luscious and long natural looking lash fibres, these are great for eyes with a show stopping edge. Soho – Bold statement lashes for girls who like to party. The lashes are priced at £8.99 each, which although is perhaps more expensive than many lashes available on the high-street, is a reasonable price to pay for human hair, reusable lashes. You can view and buy the Millie Mackintosh for Nouveau Beauty range by visiting the Nouveau Beauty website.